Stand Up Paddle Surfing: Check it out: Tim Stamps in SUP Mag! 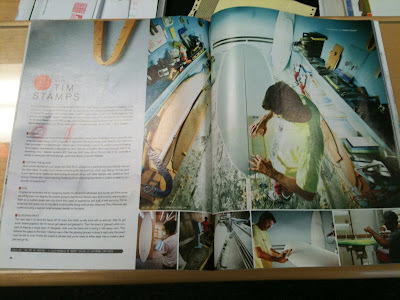 Stoked to see my shaper Tim Stamps get a shot in the new SUP Mag- grab a copy and see what he has to say about SUP design and construction. The Tim Stamps Experience.... building THE BEST stand up boards out there! hey im a bit of a techno dork-how do i send stuff to you-got a link to the infinity site with a few pics of my new race board. Email me the stuff at john@paddlesurf.net or drop me a line and we'll get it figured out- be sure to ask the Boehne if it's okay to post on my site... I'm sure they'll be fine with it- send me some good stuff!